The Historic Ballard House in Birmingham, Alabama, is a living testimony to what life was like in the African-American community during the decades leading up to the transformational Civil Rights Movement. The Ballard House Project, Inc., a 501c3 non-profit organization, is working to restore and re-program The Ballard House, one of the few surviving live-work structures, which was designed and built by African-American contractor Leroy Gaillard for Dr. Edward H. Ballard and his family in 1940. The building is designated by the Jefferson County Historical Society as an historic structure. Situated at 1420 7th Avenue, North, the cultural space is located within the Birmingham Civil Rights District. The facility is also listed on the U.S. Department of Interior’s National Register of Historic Places as a contributing structure within the Birmingham Civil Rights Historic District. The building is one of the few surviving structures, constructed in 1940, that has remained in continuous use as a residence andor medical or office space. Considered one of earlier “live-work” structures, it maintains much of it’s original configuration and handcrafted/historical detail. Plans for the project include a complete renovation of the historic building and the installation of a sustainable teaching garden. The organization programs this historic cultural space with an updated twist as a modern day gathering place with special events, seminars, lectures, weekly classes, cafe, garden, and retail component. The cultural space features historic information, educational initiatives, programming, and valued collectibles of the time period. The Ballard House cultural and educational initiatives, and period based retail component will contribute significantly to the economic vitality as an additional attraction in Birmingham’s Civil Rights District. 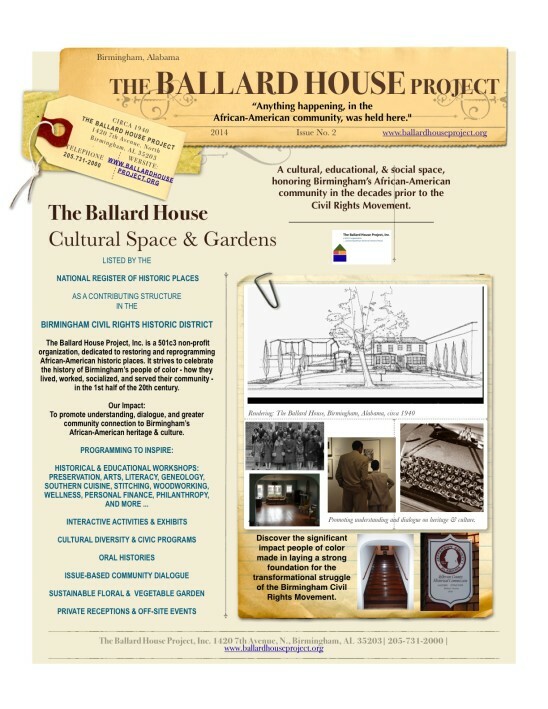 The mission of the Ballard House Project, Inc., a non-profit entity, is dedicated to restoring and reprogramming African-American historic places. Through its work to renovate The Ballard House, the organization is creating a cultural, historical & educational space & gardens, that honors the history of Birmingham’s community of color in the early 20th century leading up to the Movement. We are rediscovering, celebrating, and preserving the history of Birmingham’s African-American community – how they lived, worked, socialized, and served their community – in the first half of the 20th century. The Ballard House Project,Inc. highlights the history of professional, trade, civic, service, and social contributions made by African-American entrepreneurs and community leaders. Collective contributions of this tight-knit community were possible due to gatherings, meetings, and memories over the years in this historic building. We are restoring and renovating the 1940 historic structure and adjoining property with an updated twist to provide a valuable look into the past, while educating present-day audiences with culturally enriching programs, workshops, seminars, and exhibits. Implement a strategic capital master plan and educational programming for the historic structure and adjoining property that honors the history of Birmingham’s people of color. Gather and exhibit oral histories (Individual and Collective Memories) and digital information on the surrounding community of people, residences, civic organizations, and businesses from Birmingham’s founding through present-day. Produce cultural, historical, and educational programming for children and adults as the essence of the renovation and operation. Establish a prize-winning, sustainable, flower & vegetable garden from the 1930’s-’60’s that reflects the skill and creativity of Birmingham cultivators of the earth and providers for their families. Provide a retail opportunity that will serve as a sustaining source of income for the Ballard House Project to support capital, operating, and programming costs. To promote understanding, dialogue, and a greater community-wide connection to Birmingham’s African-American heritage and culture. Capture oral histories of what life was like in the African-American community prior to the Birmingham Civil Rights Movement. Conduct research to create a series of Historical Exhibits, detailing the history of the Ballard House and surrounding residential and business community and service organizations. Highlight, through photographs/words, the life and business of the surrounding community and its strengths. Create a replica of a 1950’s – 1960’s era Doctor’s Exam Room, presenting milestones of Dr. Ballard, Dr. Hamilton, other African-American physicians, and area professionals who contributed to the health and well being of the community. Host a Visitors’ Center dedicated to telling the history of the life and times of the African-American communities in Birmingham. prior to the Civil Rights Movement. The Information Center will highlight key facets of African-American community – civic, business, social, cultural, education, lifestyle.